With the cold weather and dark nights upon us, there’s nothing you could want more than a heart, nutritious and warming dinner. Slow cookers are perfect for this time of year, and is the perfect welcome home. Simply prepare the dish in the morning, or of course in the evening to be ready for a filling lunch the next day. We’ve found some delicious recipes which are bound to inspire you to dust off your slow cooker (if you haven’t already!). 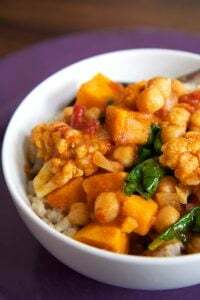 This vegetarian chickpea and coconut curry us less than 400 calories per serving! Find the recipe on Pop Sugar. We also love the look of this spicy beef curry, especially good for getting rid of a stubborn cold! This chicken saag curry looks mouth watering too. There’s nothing better than slow cooked chicken that falls apart and melts in the mouth. The great thing with slow cookers is there’s usually plenty of leftovers. I imagine this to be a perfect warmed up lunch mid week! And just look at this hearty vegan curry! Jasmine rice would be the perfect accompaniment. Find the recipe on Whole Heartedly Healthy Blog. Will you be giving one of these recipes a go?